Dupré Barbancourt a Frenchman of the Charente region in France came to Haiti in the 19th century. His obsession was to create a Rum recipe that would be special and would bear his mark on. Using the double distillation method, usually reserved for the very finest Cognacs, he came up with a Rum of unmatched quality. For some time they only produced a limited amount of Rum and in 1946 Jean Gardere relocated the plant and instigated the modernization of Barbancourt. They started to grow their own sugar cane and from a small producer they soon became an international exporter. Everything else is history and today Barbancourt is the benchmark for quality Haitian Rum. 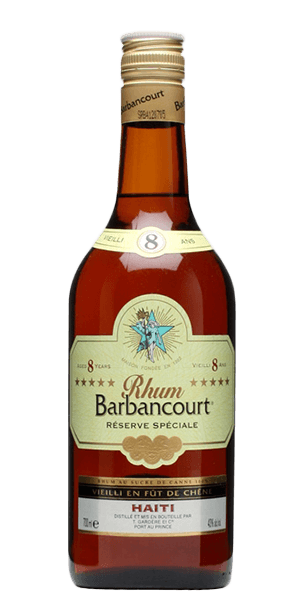 Barbancourt 8 Year Old Rhum is made of fermented sugar cane juice instead of molasses. The juice is then double distilled and aged in white oak barrels for at least 8 years. Barbancourt is especially known for its reputation for unparalleled consistency of their product that puts this Haitian Rum on the top of all slow sipping Rums from around the world. What does Barbancourt 8 YO taste like? The Flavor Spiral™ shows the most common flavors that you'll taste in Barbancourt 8 YO and gives you a chance to have a taste of it before actually tasting it. Smooth smell full of tropical fruits with hints of caramel, peach and apricot. Sweet and woody notes in harmony with fruits and chocolate flavours. Prolonged sensation of fruits and milky chocolate with some spices on top. Tangy, fruit, smoky, sugar, oak, vanilla sweetness, toasty, slightly sweet, nutty. I first tried Barbancourt many years ago in Laguna Niguel, Ca. I found it to be very smooth with an easy finish. It is of course now my favorite rum, Port Au prince Haiti! Of the three in my sample box, this was my favorite! It has a sweet, vanilla flavor that compliments the bitey spices. I'm sure to add this to my collection soon! This really changed my mind about Rum. Now this is the first I seek when entering a store...but few have it. It's worth visiting Haiti just to come back with a case or two!